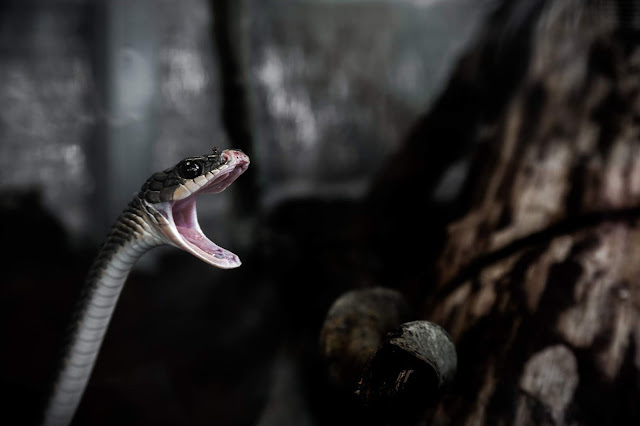 Snake bites are a potential medical emergency even though the majority do not involve significant envenomation. The role of the clinician in these circumstances is working out which patients have been envenomated, and the select group of patient which require anti-venom. Appropriate and timely action of first aid principles are fundamental in reducing the morbidity and mortality associated with snake bites. Move to appropriate area monitoring area. Identify snake if possible & avoid further envenomation by the assailant snake. Apply immediate first aid principles and Pressure Immobilisation Bandage (see below) and keep the patient immobilised/still. Liaise with a toxicologist as indicated. Establish IVC Access: Place in at least 1 IVC on non-affected limb for bloods. 2nd IVC should be established if unstable or likely to give Anti-venom. Commence with IV fluid. Be mindful of fluid overload. Consider appropriate IV Fluid therapy in Rhadomyolysis and acute renal failure. Urine dipstick - check for haematuria and can be used for Snake Venom Detection as well. First aid and PIB applied. 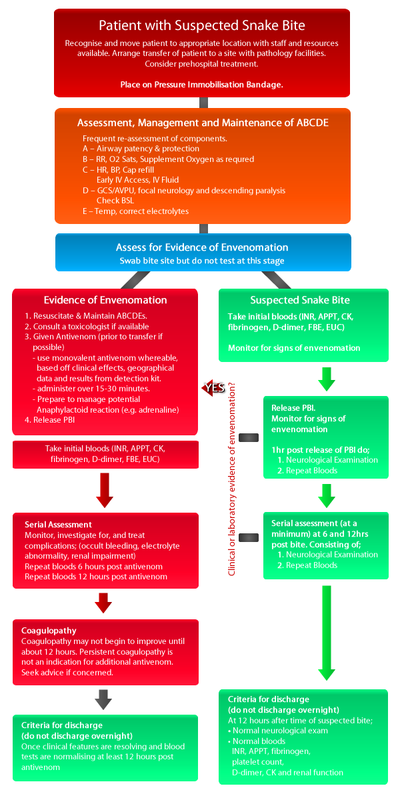 Snake anti-venom is the key treatment to managing significant evenomation and it's associated complications. Efficacy is improved with early administration, once envenomation has been identified. Risks of administrating anti-venom >24hrs post initial bite, may be greater than the risks of envenomation. Seek expert advice. Monovalent anti-venom is the preferred choice. One vial of antivenom is now recommended to treat children and adults for all snake types. The Australian Polyvalent snake venom will cover the 5 most common snake venom immunotypes in Australia and PNG. Increased risk of hypersensitivity reactions. All patient should recieve at least 1 dose of anti-venom if indicated. Further doses may be required dependent on snake, and assessed level of envenomation. Please see Clinician's Guide to Bite and Stings for more details. Administer 1 ampoule diluted in 500ml of 0.9% saline IV over 20 minutes. In children aim to keep total volume less than 10 mL/kg. Fluid therapy and feeding: A Crystalloid is appropriate for the majority of patients. In potential life-threatening bleeds the use of FFP is reasonable. Limit oral intake initially to minimize risk of venom-induced vomiting causing aspiration pneumonia. Analgesia, Antiemetic: Most patients with snake bite will not have significant pain. Simple analgesia should be sufficient. If pain is increasing it may indicate myolysis which requires reassessment. Narcotics should be avoided to minimize respiratory depression. Anti-emetics can be useful in avoiding emesis and potential aspiration pneumonia, and also for patient comfort. Antibiotics: Antibiotics are not routinely required as secondary infection from Australian snakes is uncommon. Tetanus immunity should be updated, once coagulopathy has been resolved. Sedation: typically wish to avoid sedating the patient. This includes the use of sedating anti-histamines. Sedation only for intubation purposes. Head up position: nil particular position is mandated. Ulcer prophylaxis: not routinely required. Glucose control: maintain normoglycaemia 5-12 mmol. Indwelling catheter: typically not required, but can be useful for monitoring urine output. Nasogastric tube: typically not required, and mostly should be avoided. Environment: Maintain normothermia. Keep patient or transfer patient to a monitored environment, with access to onsite pathology.